Cast: Ji Sung, Song Chang Ui, Ji Jin Hee and Yoon Ji. When the head priestess of the royal court sees the eternal land Ja Mi Won, the prophet with the holy eyes Mok Dong Yoon (Choi Jae Woong) is sent out to find it. When he finds it though, the prophecy says that the true heir of the land, the future king, is the only one that’ll be able to have it.. in 50 years’ time. Pressured by rebels and the Ming Dynasty, the king orders the prophet to be tortured for the location, and that goes on in 10 years, but all in vain. With a chance to flee Dong Yoon does so, but is followed by the princess and the love of his life Young Ji (Lee Sung Yun) follows him and demands the map of the land so her brother can get the power he is entitled. As the two spend time together and the enemies are closing in, the princess buys Dong Yoon time by following the guards back, but as it turns out she is pregnant with the prophet’s child. In order to save herself and the child she marries the man Lee In Im (Jo Min Ki) who has wanted her almost all his life, but has had an affair with the priestess underling. She also becomes pregnant, and as time pass the two give birth to sons, but In Im is determined to kill the son of the man his wife loves, though is a split second Dong Yoon manages to survive, and the princess takes the priestess son in as her own. 11 years pass and the king believing he has the eternal land has announced independence from the Ming Dynasty, and as time passes he becomes more and more paranoid with his underlings. When the priestess murders the head priestess in order to become it herself, she and Lee In Im decide to plot a coup d’état against the king, and when they hear that Dong Yoon is in the town they try to find him and his son in order to kill them both. At the same time a general Lee Sung Gye (Ji Jin Hee) famous for his military abilities surfaces and enters the palace, leaving much havoc wherever he goes. Will 50 years manage to pass in order for the Ja Mi Won to surface? And what are the roles of the two children born in the strife of their parents in this? Sorry about the major summary, but you know with these period dramas, they really start at the episode 10 marks. Okay, so this is one heck of a drama, besides it being made extremely well, the storyline and the characters are very well written. Though I really didn’t like the choice for many of the actors (hint: lead actress) the general story is not only interesting, but it’s very close to the historical part - which I did not expect since the ‘good’ guys aren’t as good in real life. But they did add the bad part, which makes the story amazing but the character less likable. Another thing that made me intrigued is that the secrets that usually take forever to be revealed are revealed in matter of episodes, and some are never told. So it depends on who watches it to distinguish what you would think of it. I liked it, because it made it more real. 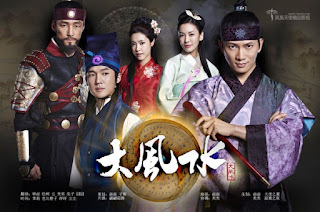 All in all a fine drama might be one of the only period dramas I actually genuinely like.